President Omar Al-Bashir said his country is ready to further strengthen relations with Ethiopia. Al-Bashir expressed his delight on the prevailing unity, peace and tranquility in Ethiopia. The President noted that Sudan was eagerly waiting for the visit by Prime Minister Abiy Ahmed and said that the visit is a vivid demonstration of relations of partnership between the two countries. He added that his country is desirous of boosting the existing trade, investment and infrastructural development programs between Ethiopia and Sudan. Al- Bashir stressed that Sudan will continue to work with Ethiopia on ensuring sustained peace in the Horn of Africa and the fight against terrorism and human trafficking. Prime Minister Abiy on his part thanked President Al- Bashir for the support provided by Sudan in restoring peace in Ethiopia. 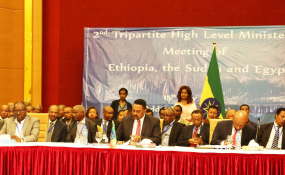 He also noted that Ethiopia is committed to strengthening people-to-people relations between the two countries. The Premier thanked President Al-Bashir for the principled support Sudan has given to Ethiopia on issues surrounding the construction of GERD. Abiy is also expected to discuss with his Sudanese counterpart issues of bilateral importance and would later pay visit to various Sudanese development projects.